Safavieh Lighting Rista Shelf 58.5 Inch Floor Lamp - Assorted - 10" x 10" x 58.5"
Safavieh Lighting Rista Shelf 58.5 Inch Floor Lamp - Cherry - 10" x 10" x 58.5"
Safavieh Lighting Rista Shelf 58.5 Inch Floor Lamp - Black - 10" x 10" x 58.5"
A chic blend of form and function, this shelf floor lamp is a stylish storage solution in any bedroom, living room, or home office. It's black metal frame features contrasting light brown shelves and a sleek off-white shade. Dimensions 10.0 In. X 10.0 In. X 58.5 In. The ambiance of any space is inseparable from the style and placement of its lamps. Here's how to decorate with lamps to enhance the mood and decor of your room. Lamp shades help control the amount of light emitted into a room and add to the overall look and feel of your decor. This guide will help you pick the perfect lamp shade for every lamp in your home. Nothing gives decor a face lift like the right lighting. It accents your home, adds warmth where there's no natural light, and helps set the mood. 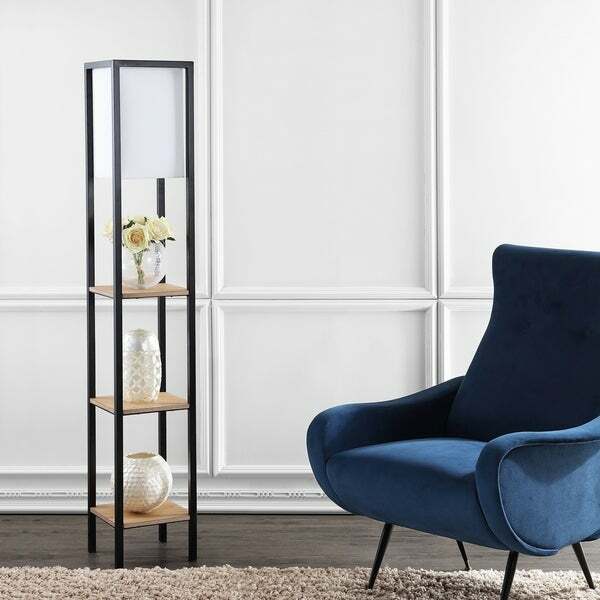 Whether you're looking for a great reading light or stylish illumination for your home, you can step up your home decor game with our top three favorite floor lamps. When you're looking for a new lamp shade, it's important to know the size of your current lamp shade so your new one fits just right. To measure your lamp shade, grab a measuring tape and something to write down your measurements; then follow these four easy steps.